The A Vous la Parole French speaking contest was founded in 1973 by Carleton College professor Michel Monnot, held that year at Carleton College, and then for many years on the campuses of small private colleges and universities in Minnesota continually under the sponsorship of the Minnesota Chapter of the American Association of Teachers of French. After a short break and some strategic revisions, the AATF Minnesota Chapter's AVLP has been hosted annually in UMN-TC's Coffman Memorial Union by the Department of French & Italian. On April 26, 2018, there were 1241 participant entries from 26 schools in six categories: poetry/prose, song, theater, original skit, extemporaneous reading, extemporaneous conversation and 22 subcategories. Medals awarded: 686 bleu (excellent), 424 rouge (très bien), 106 blanc (bien), and 15 certificats de participation. The same team has been running the contest for the past several years. Annie Muske serves as coordinator and organizes the t-shirt sales. Clare Hagen heads up scheduling and awards. Betsy Kerr is in charge of judges and the on-site arrangements. 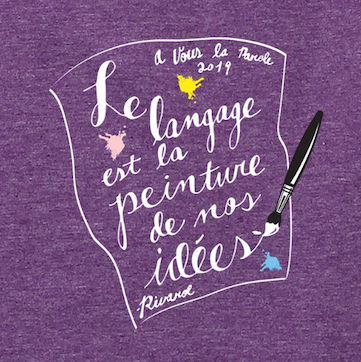 2014 was the first year that schools participating in A Vous la Parole received Renaud prizes. $750 in Amazon.com gift cards were distributed among the schools that had at least 10 entries in the contest. The teachers purchased French-related prizes for the students that they deemed most worthy of the awards. "Armand Renaud, emeritus professor of French, passed away in Minneapolis on February 16, 2012, at the age of 93. With his passing, the U of Mn TC Department of French and Italian lost a valued former colleague and generous supporter. In his will, Prof. Renaud left funds specifically designated for prizes for A Vous la Parole. [Student name] has been awarded one of the Armand A. and Madeleine S. Renaud Endowment Fund prizes." Armand Renaud was born in the French-speaking community of LaSalle, Ontario, Canada, in 1918. A naturalized US citizen and US Army veteran, he graduated from Assumption College (Windsor, Ontario) and Wayne State University. He had intended to attend medical school, but during his studies in Paris, where he took classes in medicine and literature, he was increasingly drawn to literary studies. Upon his return to the US he received his Ph.D. in French at Yale University. After teaching briefly at Northwestern University, he joined the University of Minnesota faculty in 1957. He served as chair of the then Department of Romance Languages for many years, where he introduced courses on existentialism, the theater of the absurd, and Francophone African writers, at a time when students in French Studies -and most teachers- had yet to discover the significance of African writers writing in French. Born in France, Mr. Renaud's beloved wife Madeleine Renaud taught French at the Blake School in Minneapolis, where she was a wonderfully gracious teacher who gave generously and inspired many of her students to become fluent in French. She also provided help and support to Armand at the University of Minnesota. Both Armand and Madeleine remained strong supporters of French, spending their lifetime in service of "la civilisation française et francophone", especially in their work with and support for the Alliance Française and A Vous la Parole. We are very grateful to the Renauds for their generous gift to the high school French students of Minnesota.